Gujjars are one of the communities of tribes inhabiting in India. Gujjars mainly inhabit in the states of Jammu and Kashmir, Himachal Pradesh, Haryana, Punjab, Uttarakhand, Delhi, Gujarat, Rajasthan and Maharashtra. These tribes can be found mainly following Hindu and Muslim religions. It is believed that Gujjars were the original inhabitants of Gurjia or Georgia. They came across Iraq, Iran, Central Asia, Afganistan and Pakistan to Gujarat, way back in 5th and 6th centuries. Some also believe that Gujjars were earlier Rajputs and they changed their religion to Islam after losing to Aurangzeb in battle. 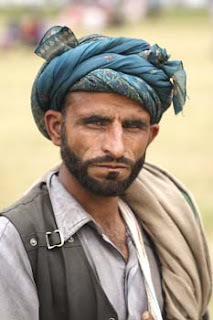 Gujjars come in the category of semi-nomadic tribes and their main occupation is herding of goats, sheep and buffaloes. Semi-nomadic people of Gujjar community are in the habit of migrating to upper parts of Himalayas along with their cattle during the summer season and back to the plains with the onset of chilly winters. As Gujjars keep on moving from one place to another, they move with their families and thus have very rare permanent settlements. Wherever they go, they reside in shacks or huts made of grass, wood or bamboos as per the availability of raw materials. They sell milk, ghee and their cattle to make their living. Gujjars, who are now-a-days mainly found in the Northern parts of India, speak Hindi, Urdu, Kashmiri, Dogri and Pahari. They are the tribes who strictly follow old traditions and customs. They still follow custom of early marriages, where girls are married at an age of 14 – 15 years and boys at 17-18 years. Mostly they depend on milk products as their staple food besides cereals, wheat and maize. They may be vegetarians and non-vegetarians as well. Gujjars wear their traditional dresses. Men adorn turbans on their heads in Mughal style along with long and loose 'Kurtas' or shirts with 'Salwars'. Over the shirt they wear vest-coat called 'Basket'. They also wrap 'Chaddar' or shawl around their shoulders to save them from cold. Whereas, women wear loose 'Kurta' (shirt) having collars and cuffs along with 'Suthan' or 'Salwars' in Churidar style. They flaunt vest-coat over 'Kurta' like men . Women also wrap a 'Chaddar' around their heads which is also called as 'Neelak'. Both men and women wear 'Desi Juttis' or shoes. Gujjar women are also fond of jewelery like necklace, nose rings and ear rings mainly made of silver. Now-a-days, there has been a change in the lifestyle of Gujjars also like other tribes, with the change of time. In the olden days where they used to be illiterate because of their nomadic life, now some of them have started dwelling in permanent settlements and impart education to their children.